brown sugar | "blackberry-eating in late September"
When it rains in Los Angeles, the whole atmosphere of the city changes. The earth sighs acceptance and glee, and the ordinary dustiness of every other person’s front yard glimmers with emerald slickness: life! Reprieve from the desert we pretend we haven’t built over! The roads become jagged, glistering, tar and oil stained slip’n’slides on which people drive either too slowly – avoiding disaster through excess caution – or too quickly – rushing to get off the highways as soon as possible. The sky is unused to gray billows here, or at least it seems that way. But for me, the end of this week felt like home. It was a strange mix of homesickness and invigoration. I am accustomed to working in this climate. It feels natural. Habitual. My fingers and my brain and my skin – they fit into this overcast world. Seeking the comfort of familiarity, I decided to leave yeast alone for this week and fall back on something I know: biscuits. Butter. Flour. Buttermilk. Salt. Baking powder. The blessed fundamentals. But I know the fundamentals. I wanted more. In Ratio, Ruhlman calls these Chicago biscuits because their ratio 3-1-2 is Chicago’s area code. 3 parts flour, 1 part fat, 2 parts liquid. I’m calling them Uncommon because their pairing – brown sugar and extra sharp cheddar cheese – might not be anyone’s first inclination. It made sense to me, though, if you reinsert the missing link of apple pie in the middle. Cheese and apples are perfect. Brown sugar and apples are perfect. What would happen if you took the apples out of the equation and left the savory richness of cheese chewing against the molasses-deep hum of brown sugar? They are also Uncommon because they take a little extra time (almost 3 hours from start to finish) and produce a slightly different product than your ordinary dinner biscuit. Adapted, obviously, from Ruhlman’s Ratio 312 Biscuits. 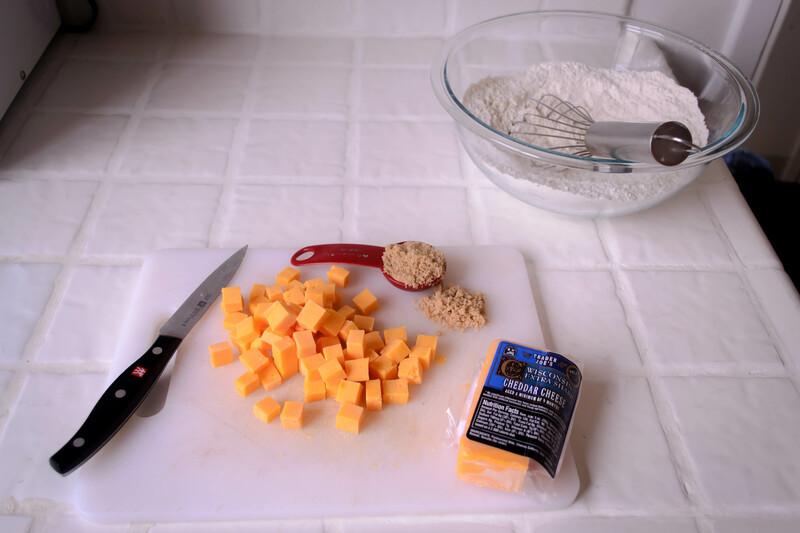 In a medium bowl, whisk together the flour, salt, baking powder, and brown sugar. Using a pastry blender or your fingers, cut in the butter until it is incorporated throughout in chunks the size of small peas. 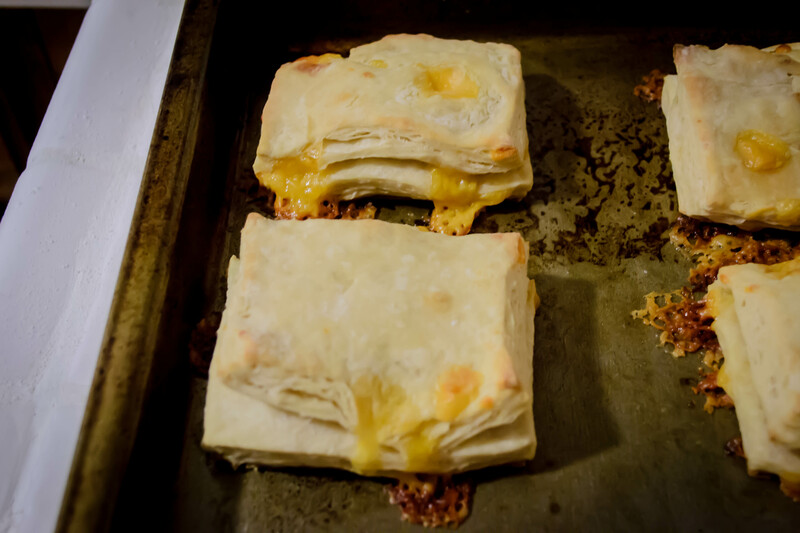 Add the cheddar cheese and buttermilk and mix to combine into a rough, sticky dough. I find using a fork works well for this step. Here’s where things change up a bit. Instead of rolling this out and cutting rounds, stretch a piece of plastic wrap across your counter and dump the dough onto it. 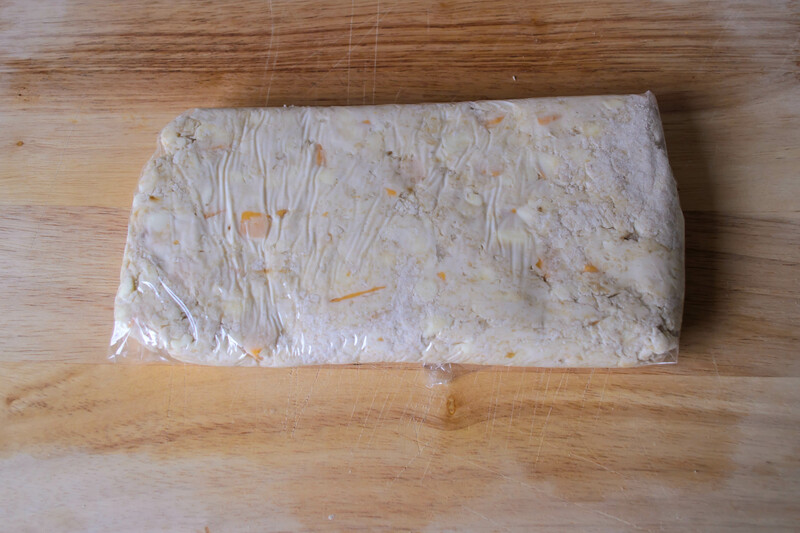 Using the plastic wrap, form the dough into a rectangle of approximately 4×6 inches. Mine was bigger because I am impatient. This didn’t seem to have dire consequences. Once the dough is shaped, wrap it in the plastic wrap and refrigerate for at least 1 hour. After an hour, the butter has firmed up again and the dough has relaxed. Pull it out and free it from the plastic, plopping it carefully onto a well floured board. It’s a very sticky dough, so flour your rolling pin and the top of the dough itself well to avoid irritation. 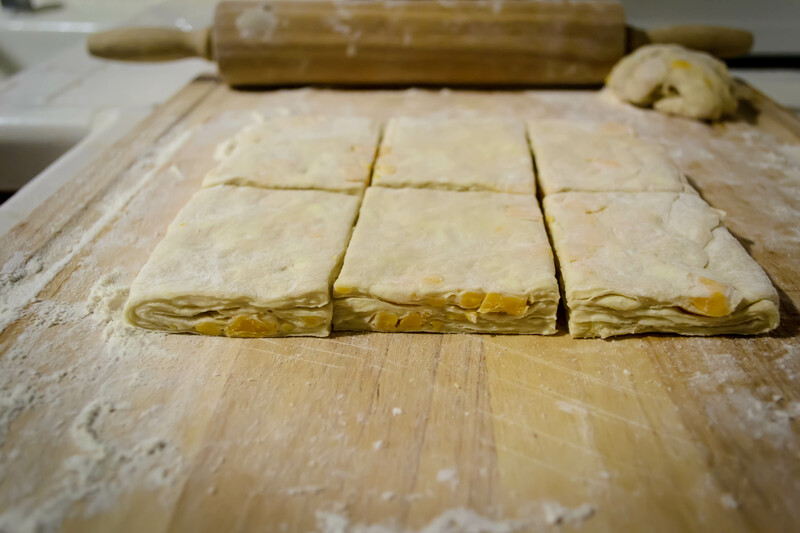 Roll the dough out until it is three times its original size, maintaining the rectangular shape. Fold it into thirds, press down well, and then roll it out again. Fold it into thirds for a second time. I did mine in the opposite direction of the first fold, which was probably wrong, but again, produced no discernible taste consequences. Press down firmly, wrap up the dough in plastic wrap again, and put it back into the fridge for another hour. While it chills, here’s what’s happening with all this bother: you are creating something akin to one of those biscuits that comes out of the tube. You know, the cardboard tube you anxiously peel the wrapper from to reveal a twisting seam, then judiciously smack on the edge of the counter until it pops and dough appears in great bulges? Those biscuits are composed of dozens of flaky layers, and that’s what you are doing by folding and rolling and folding and rolling. 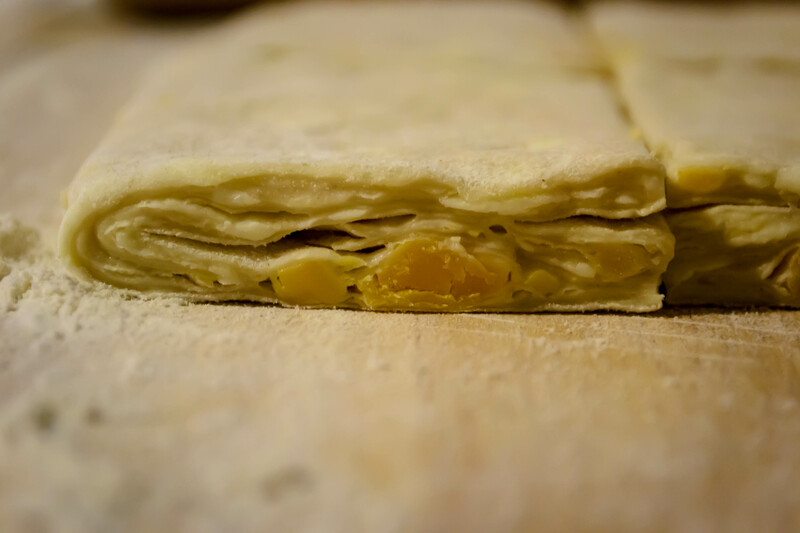 You are, Ruhlman notes, following a similar procedure to that used for making puff pastry, except in our case the butter is irregularly placed, which results in craggy puffs, whereas puff pastry requires a smooth, even layer of butter in between each floury fold to reach its incredible signature height. 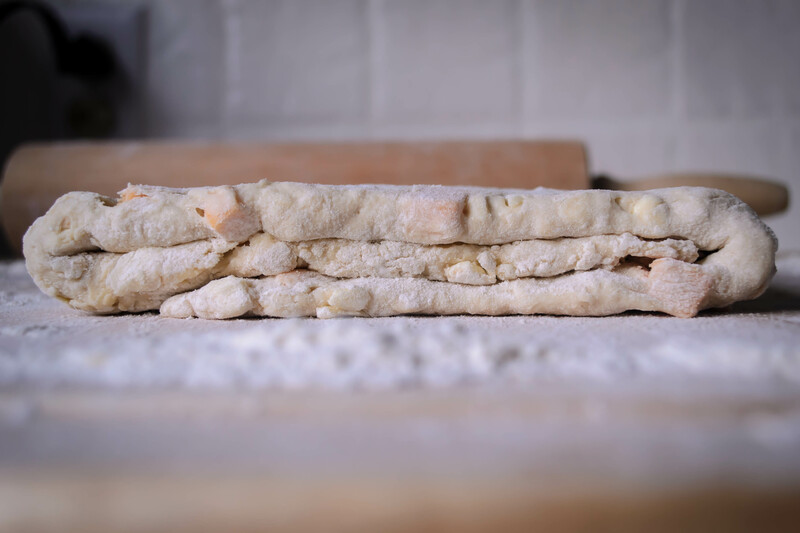 With another hour gone, liberate the dough from fridge and plastic, return it to your well floured board, and repeat the procedure: roll out, fold in thirds, roll out, fold in thirds again. At this point, you should also preheat the oven to 400F. You’ve now folded your dough a total of four times, which means you’ve made twelve layers. Now, roll it out to ½ inch thick and cut it into 6 pieces. 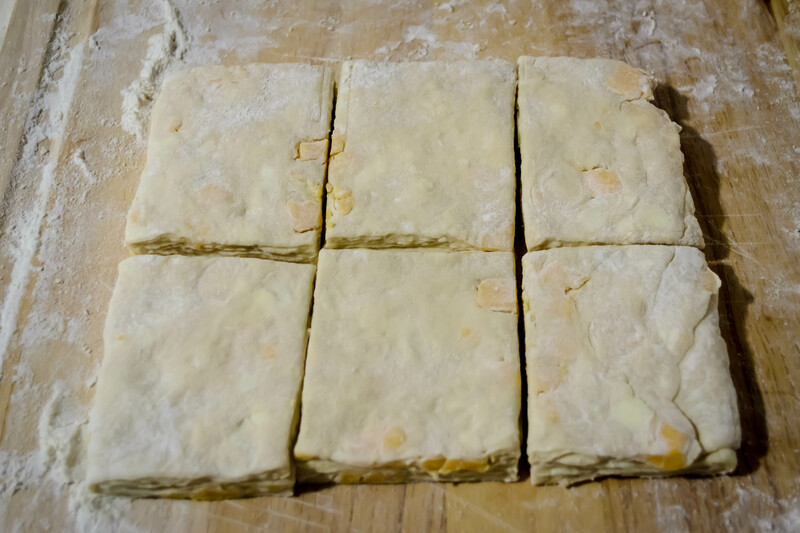 You could do rounds with a biscuit cutter, but it seems easier and less wasteful to just trim up the edges (which you could roll into a homely little extra biscuit to taste on the sly) and then cut into squares. 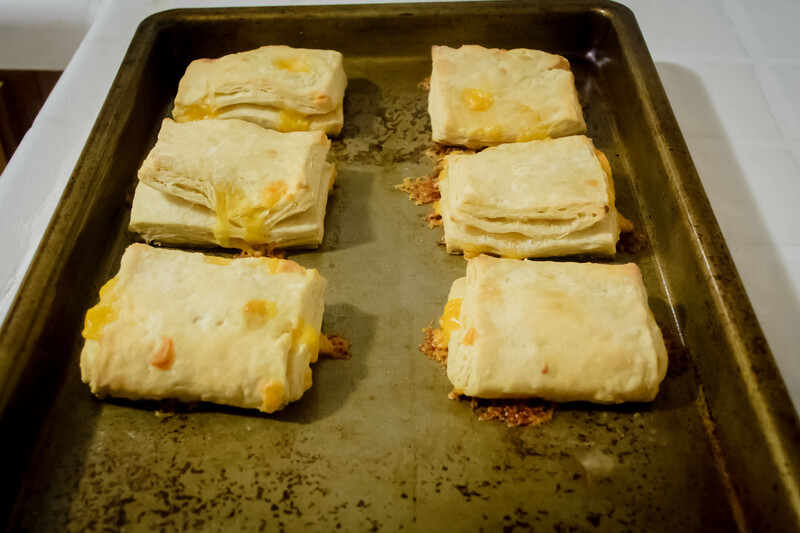 Pop these onto a greased baking sheet and into the oven for 20-25 minutes. 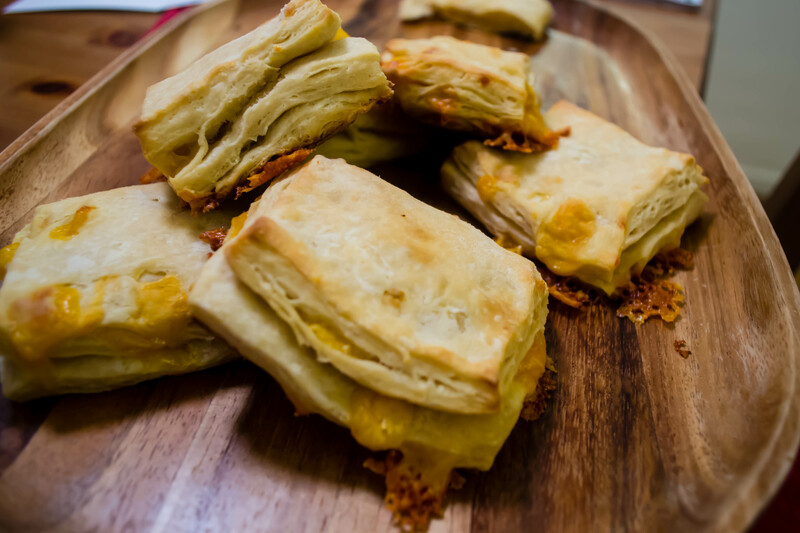 They will emerge lightly golden on top, with cheese oozing out from between the layers to form crispy lacy edges against the cookie sheet. We ate these as an accompaniment to a honey mustard roasted acorn squash and chicken apple sausages. I know, I had to get the apple back in there somehow. My assessment? They were delightful. The exterior was flaky and crisp, and I was impressed by how the layers really did make a difference in the texture of the biscuit: they were moist and chewy and distinct. The cheese wasn’t as noticeable as I’d thought it would be, though the crispy edge bits were lovely – much like the lacy brulée that adorns the outside edges of a good cheese bagel. At first I thought I couldn’t taste the brown sugar at all, but as I took my third and fourth bite, gasping around the steam, I realized that the complex lingering warmth at the end of each bite was probably the effect of the brown sugar. It carried the depth and richness of a caramel without being sweet. So the verdict is: if you need biscuits to go with a weekday meal, these are probably not the ones for you. 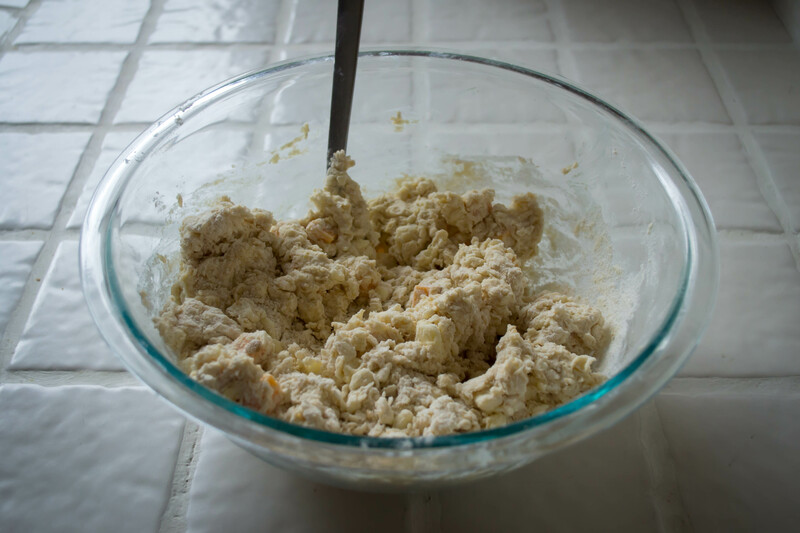 It’s asking a bit much to devote three hours to six biscuits, when you could just roll, cut, and bake the same ingredients straight from the mixing bowl. But if you are planning for something special, or if you were thinking of baking bread anyway and are willing to replace rise time with refrigeration time, try these instead. 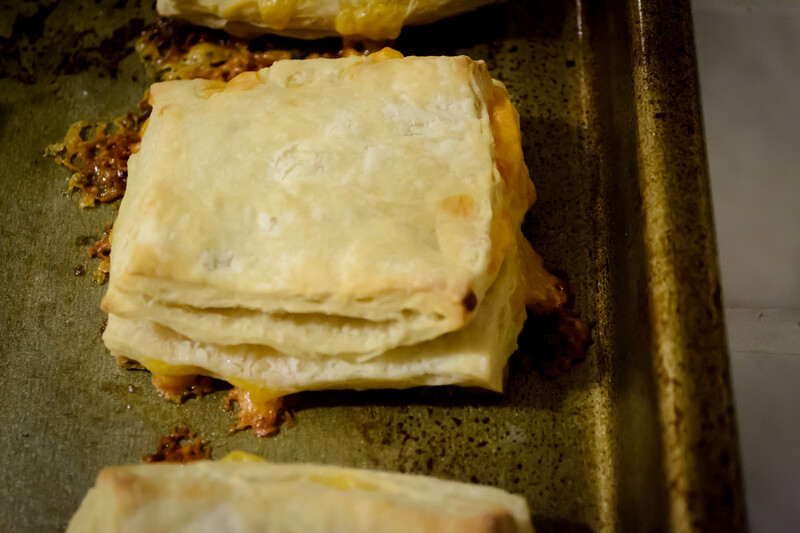 The layers are really remarkable, they stay warm for some time, they are all kinds of tasty, and they would reheat – I suspect – very well in a toaster oven, though they are best on the day they are made. But you probably won’t have any left over, so that’s an issue barely worth discussing. I hope you are warm and well, wherever you are.